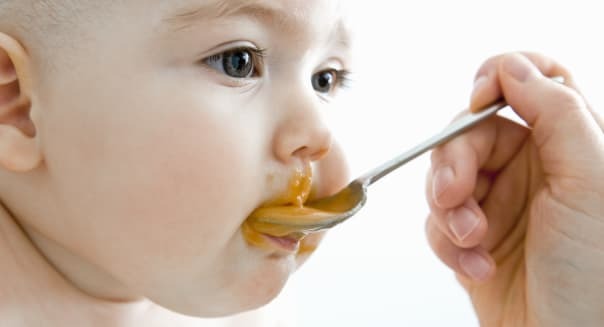 NEW YORK -- Federal food inspectors have announced the recall of 1,920 pounds of sweet potato and chicken baby food made by Beech-Nut Nutrition, saying it may be contaminated with small pieces of glass. The problem was discovered after Beech-Nut received a complaint from a consumer who found a small piece of glass in the product, the U.S. Department of Agriculture's Food Safety and Inspection Service said Tuesday in a statement. %VIRTUAL-pullquote-Outside of this single report, we have no indication that any other jar of our Classics Stage 2 Sweet Potato & Chicken is affected...%Beech-Nut, based in Amsterdam, New York, also learned of an oral injury associated with consumption of the product, it said. "Outside of this single report, we have no indication that any other jar of our Classics Stage 2 Sweet Potato & Chicken is affected, but as a company of parents and families we are acting with an abundance of caution," Beech-Nut said in a statement. The 4-oz. glass jars containing "Stage 2 Beech-Nut CLASSICS sweet potato & chicken" were produced on December 12, 2014. They bear the establishment number "P-68A" inside the USDA mark of inspection, show an expiration date of "DEC 2016" and include product numbers "12395750815" through "12395750821." Beech-Nut, which is owned by Swiss-based Hero Group, said it was encouraging customers to return the recalled product to the store where they purchased it for a refund or exchange.